Join us, The Australian Ballet and the Bolshoi live on 2 October for a day-long celebration of all things ballet. World Ballet Day is back! Join us, The Australian Ballet, the Bolshoi and guest companies from across the world for a day-long celebration of all things ballet on 2 October 2018. Full details of the companies taking part are available on our Facebook event. Thank you all for watching: the YouTube video will be uploaded onto this page as soon as possible. I was already waiting for this event!! Just remember that too much talking during the class is really disturbing. It's enough to watch the teacher and dancers while listening to any wonderful pianist who we'll be lucky to have. And, please, don't interrupt the view of the dancers by focusing on somebody's feet or face for a whole minute or so. I endorse everything you say. We do not need this mindless commentary - just want to watch the class roll, listen to the teacher setting the class and hear the musician. And someone needs to educate the cameraman. We need to see the whole body, not be panning into faces and feet. Won't Canada and San Francisco participate? LOVE, LOVE World Ballet Day. Would it be possible to answer two questions, please? One, how are dancers partnered up. The matchup appears, when good to have an element of magic - witness Sarah Lamb and Steven Macrea. How do Directors make those pairings, please. Two, I'm fascinated by dancers who opt to become Character actors. What motivates then? I know it isn't wasting their classical training, but I'm curious about the extra training the must go through and how they mentor and are mentored. Many thanks for considering my questions. Is the broadcast only on Facebook? I have several relatives who aren't on Facebook, how can they watch, please? The broadcast from The Royal Ballet will be on Facebook, live, but will be available on YouTube for 30 days following the stream. This is such a happy event. Thank you Royal Ballet for celebrating and sharing World Ballet Day. I hope to watch a great many dancers in ballet class since this is what I enjoy most. My absolute favorite day of the year, World Ballet Day! We'll be updating the schedule for World Ballet Day slightly closer to the time - it's determined by our rehearsal schedules as a working ballet company, and we need to balance the demands on the dancers. We'll announce the schedule soon on our social channels. They've usually started when I tune in at 6am, but I have never woken as early as 4am to see if they have started streaming that early! I suspect that in France you should have nonstop streaming from 7am to 9pm at least, if not longer. Is it possible to place a recording of the complete day here, YouTube, etc. I would love to see all the events of the day, but due to a need for sleep and work...I can only watch the recordings. Thanks. Yes, we'll be uploading our full stream to YouTube after the event. I note that World Ballet Day is to be on Facebook - but will it be streamed on the ROH YouTube site as well, as I don't do Facebook? Yes, we'll be uploading our full stream to YouTube when the broadcast is over. We're updating all the details on the Facebook event as soon as they're confirmed - due to the nature of the event, and the fact that we are broadcasting rehearsals as they take place (we are a working ballet company and schedules sometimes need to be adjusted to ensure the timings work for the dancers) the timings are subject to change. Sorry we can't be more concrete at this stage, we'll announce as soon as we are able! Hi - I am going to be away abroad on the 2nd October. How can I find a way to watch the World Ballet Day when I return? World Ballet Day will be shared on Facebook live on the day, but will be made available on YouTube after the stream is over. Are National Ballet of Canada and San Francisco Ballet not taking part this year? If so, that would be a great pity as that means no host company from an entire continent will be in it (it wouldn't be World Ballet Day but just Europe and Australasia Ballet Day)! These two magnificent companies were with World Ballet Day right from the start- it was exciting to see the livestream actually happening outside Europe across the Atlantic. I remember watching, even joining in, NBC's class with excitement and how thrilled we were to see the stars and young newcomers of SFB enthusiastically taking part, with senior principals or choreographers from both explaining their work to the worldwide audience (while we were having supper in Britain)! I hope there will be a later announcement that NBC and SFB will be able to be part of the livestream. How can I watch World Ballet Day with I am not on Facebook of other social media sites? How can I watch the World Ballet Day when I am not on Facebook or other social media? You don't need a Facebook account to watch - the video is embedded on this page and you can click to watch when we go live at 12pm. The stream is also being shared in China via Tencent, so they won't miss out. If it's only being streamed on facebook then I won't be able to watch live, how disappointing. No need to take the time off work. Facebook live - so those who don't do facebook have to wait for the You Tube version. But will that be all of those 20+ hours, or just excerpts?? Could we follow the day on each company's own website? And at what UK time will the RB section start? I'm still not receiving any info from World Ballet Day, despite having signed up, yet again. Like lst year, and the year before. So still none the wiser. Could you please, please give the info sought, not just by me, but by many other dance fans, young and old? Cf my previous posts and those of others. Thank you. Do you already know the schedule for World Ballet Day? I am trying to find out what time the Royal Ballet part starts, but neither can't find the detailed info nor know what you mean by "our social channels". I cannot trust the info on Facebook because it shows the wrong date of 2017. Hello, still no answers to basic questions. World Ballet Day website just refers to Facebook (and never send out any information anyway, even if one has registered). But will those who don't do Facebook, be able to view the whole day or are they to have to be contented with excerpts? AND WHAT ARE THE TIMETABLES? Surely you know by now at what time each of the three main companies begins and ends? There are people who would love to watch, but need to organise their timetables in advance. Thank you for answering. This year, we're not broadcasting in one linear stream - we're all sharing on our own pages throughout the day. We've been updating the Facebook event with scheduling information but have now included this information on this page too. All the details from all the companies are live on our Facebook event. Hello, Still no answer to the World Ballet Day Schedule and Facebook questions raised by a number of people on this site. I always enjoy the music during company class, my favorite pianist being Paul Stobart. Will he be playing this time? Looking forward to this but the whole event is still as clear as mud. According to facebook link half an hr ago, as directed from this page, it was less than 1hr to go (presumably midnight UK time) yet this page states live at 4am!? Facebook link gives details of whats on the whole day not just from RB, but all times are in a variety of time zones speak making it near impossible to understand. Its been world tie yourself in knots day so far! "3.10pm: Rehearsal with the Royal Ballet School"
Will this be the new Liam Scarlett piece he's choreographing on the students? I hope so!!!! Merde for another fantastic World Ballet Day! I am not on facebook too. Why are you using only facebook? What about you tube live? What are the options for all of us? Please can you spread world ballet day live on other technical platforms as well ?? !!!!!!!!! There are so many ballet lovers al over the world (not using facebook) who would appreciate that so much!!! Friends of mine just tried watching the stream from Australia - they failed with safari saying: too many redirections , safari cannot open . Hopefully that does not happen while you are on air live. The stream isn't available on WorldBalletDay.com - we recommend you watch the stream from The Royal Ballet in platform on Facebook or on this page, where we've embedded the livestream. Disappointing if only on Facebook. Not only is not the social media platform of choice but it is banned in many workplaces. Yes, we'll only be streaming on Facebook but the stream will be available on YouTube on demand following the event. A bit rum that those of us who don't do social media are unable to view this. So disappointing, unless I'm looking in totally the wrong place! It's disgraceful that we can't watch this event unless we're on Facebook. I've watched it live stream for years, but never on Facebook. I earmarked today to have no other events and now I'm left high and dry. Who makes these decisions to exclude those of us who are smart enough not to be on social media? You don't need a Facebook account to watch the stream; please click the link to watch the stream and dismiss the pop up that prompts you to get an account. Still no live stream through Facebook, many people must be livid, looking forward to this day all the year. Our livestream goes live at 12pm UK time. I'm so furious I can't watch this live - I don't want a Facebook account (data breaches etc) I've swapped my days at work to be able to watch live! I've been trying to watch since 8.30am - imagine my frustration. To be honest, this is a disgrace. People the world over are struggling to find the links on Facebook. I simply do not understand why you do not 'live stream' this yourselves as you do for Insight events etc. Don't you want people to watch unless they first endure unnecessary stress? The obvious place to find the RB should be on this website. But I guess that there is some financial gain for the ROH in showing it this way? We've chosen to share the stream on Facebook this year as we're able to reach the largest number of people with our livestream this way. There is no financial gain for us in doing this. The link to watch the stream is available to anyone, whether or not they have a Facebook account. I find it unacceptable that I would have to join an organisation like Facebook in order to watch World Ballet Day live. I am not on Facebook and am not happy to join. As a major supporter of the Royal Ballet for more than 40 years I think people like me are being treated shabbily. You don't need a Facebook account to watch - simply click the link to watch the video and click 'Not now' when a prompt to set up an account shows on your screen. Was thinking no simple world timetable and a horror mix of time zones that was impossible to work out was the main problem, but reading comments here today seems its only on facebook! how sad, many loyal ballet fans do not do facebook, so its not inclusive. An australian section had appeared on utube, can't hear a word they are saying as other years, not sure why they even try audio. So only RB sections will be available after? was looking forward to another 'world' experience in real time, its a real shame. Great. Wait all year for this and then can't watch it because it's on Facebook! The best day of the year to catch up with admired companies. This innovation and broadcasts to cinemas are wonderful. Trying to have a peep during my short lunch break at work - but face book is banned. Why, WHY are you going through Facebook? I was not happy to hear Facebook was going to be the only way to see the world ballet day 2018 as it is like Big Brother, but I openned an account, but even so it is not working. There must be a better way for the next time. Such a shame!! To see the video later is not the same as seeing it live. Been watching the morning footage from the Bolshoi and Royal absolutely fine. Cut to Birmingham R/B and sound has gone?? The ROH stream is total rubbish - please never use Facebook again. (The Russian feed was better actually, but both suffer from frozen screens/blacked out screens/jerky action/no sound at times, like now,) Even when the action is "live" and not gone black or frozen, it's fuzzy/out of focus. I've seen this before with Facebook streams of live events. Thank you very much from Moscow. The ICT has been poor this year - I can’t get it on Facebook or on this page. Hugely disappointing. My computer has crashed enless times on this facebook connection, unable to view more than 5 mins of this wonderful day! frustrated! This is an appalling mess as every way I try to view anything it is not available. what a shame I can't watch this live!! your embedded video does not work and tried colleagues with Facebook but nothing. Finally found it by going to ROH www on my mobile...too late for my sons performance though.. I took the day off work in order to watch, to find on looking closer that it was only available on Facebook. I don't use Facebook for a variety of well publicised reasons. While you have told us repeatedly to view on Facebook and advised that it will be available afterwards on YouTube - not the same thing at all, live is live not history, you haven't explained why you have chosen to use Facebook, thus excluding a proportion of your loyal supporters. What is the explanation?? We've taken the decision to share the stream on Facebook in order to reach as many people as possible, so we can share our love of ballet with as broad an audience as we can. The stream is available to watch, whether or not you have a Facebook account, so we hope you're able to watch by clicking the link to watch the video. In response to Mel's response to Toni, no, the stream was not available to watch without a Facebook account. In order to watch it, one was requested to log in to Facebook. I do not and will not use Facebook and I think that the Royal Ballet's brand should not be associated with any particular social media platform. You should built an information sharing platform on your own website and start using it. Promote your brand, not Facebook please. What you say above about not needing a Facebook account does not appear to be true now that your embedded screen has disappeared from your web page, at least if one is using an iPad. The Facebook app does not offer a ‘not now’ option. yes, very disappointing total coverage this year. For the same reasons as Toni i do not venture into social media. I set aside the day but the window offering the live stream informing us to refresh the page at 04:00 hrs never worked until after midday UK time. Live YouTube is surely more widely accessed. Last year seemed to flow from one Host company/country to another, but not apparently this year, so I and others having missed the earlier contributions, cannot continue to admire the expertise from across the Atlantic. I do hope the strategy will be re-thought across the board for next year. Is it possible to watch it now that it has finished? Or will we have to wait until it is uploaded on YouTube? We'll be uploading on YouTube as soon as the stream has finished processing. I have a PC with two different browsers, an iphone, ipad and a smart TV (LG) and I can't get the Facebook video on any of them. I am also a Friend of the Royal Opera House and a regular visitor to live ballet performances. ROH, what seems to be getting missed here is that even if people clicked the link here on this page to watch the livestream, it didn't always work. The connection was intermittently interrupted/inaccessible. Thanks for your comment. I can confirm that other than one technical issue with the sound, the five hour livestream was broadcast successfully without interruption. We will be adding the YouTube link to this page as soon as it is uploaded; many thanks for your patience. Mel- even if it was broadcast successfully it doesn't mean viewers could actually see it. You'll have to ask Facebook and their IT experts why it crashed so much.....especially during the popular segments! The huge numbers of people posting emojis and comments simultaneously might have something to do with it. Yet Youtube seemed to handle reactions or comments very well in the past without freezing constantly. Far from attracting more people to view the events, it actually caused more people to switch off. I don't think you can say it was a resounding success when the millions who were logged in for 10-20 minutes were actually looking at frozen screens half the time (and then walked off to get coffee for the rest of it). Unfortunately, it was very unclear that it was actually possible to watch WBD without going via Facebook and, as three of my devices had a blank on your page where the screen should be, there was no option at all on them. However, having struggled to get something on my phone and one computer, the feed kept cutting out and the segment on BRB had no sound at all. You are speaking of reaching as many people as possible but, on the basis of reports from friends across the UK and some abroad as well, I have to tell you that you failed spectacularly. Some had taken days off work and all they got was frustration. This relfects very badly on the ROH/RB. When I tried to click on the link it goes straight to the 'log in or join' page. There is no option to say ' not now' . I tried this first thing this morning and again after a day at school teaching. It wouldn't work on either occasion. So disappointed. So disappointing the livestream did not work for so many. Hope it is corrected for next year. The YouTube link now appears to be up but is showing as “video unavailable.” More problems. Please sort this out. I’m relatively computer savvy but the whole thing seems to have been made unnecessarily complicated with people struggling to even find the right links in the first place. It really needs looking at for next year. Enjoyed what I salvaged live.... and hope to see what I missed (atleast from UK) another day. You say you decided to share this only on facebook to reach as many people as possible, but it really failed unfortunately, there were many different problems as listed on here, I also experienced alot of 'buffering' lost connection particularly on the first la bayadere rehearsal which I was really wanting to see, missed it completely ..and then no sound. Why break something that wasn't broken!? Everyone has access to Utube! so its inclusive and I've never had any of these technical problems since yr1... and you could see the rest of the world which was kind of the idea wasn't it? I do not believe it was a success to have such a separated world ballet day, where we non facebook fans can only see UK broadcast thanks to a kindly link here.. which was however appreciated. Thanks to everyone involved today! and atleast I saw some of it uninterrupted which was great! but please realise that this facebook venture was neither technically upto a standard to showcase dance nor the spirit of a united world. I've already seen the YouTube version. Just a couple of cuts, but it's ok. Please, please, don't lose some parts - like interviews or short rehearsals- like you did last yea, after you break it up in small pieces afterwards. Last year, we lost some parts, and we don't want to miss anything in the future. And thanks so much Royal Ballet for letting us be part of you for some hours and for preparing this day so lovingly and carefully. I loved to watch all the principals!! And equally I loved to watch Mayara in her incredible variation as well as Joseph Sissens solo. They were a treat to watch. And for the whole ensemble: You're the core of the company. Each one of you, with no exception is a unique, beautiful and talented dancer. i watched it all later on you tube perhaps next year streaming on both facebook and you tube might be the answer . Being as popular as it is the more live streams the better. Is it possible to re-upload the video, please? It's not on You Tube anymore and I haven't had the chance to watch it, unofrtunately. We're afraid our rights agreement doesn't allow this - sorry! 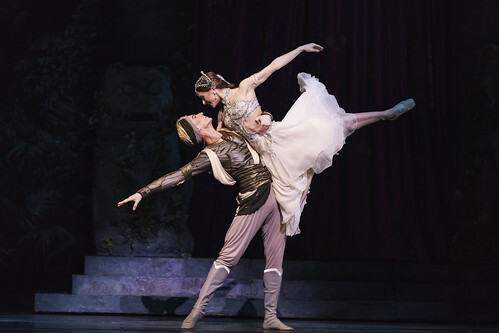 Liam Scarlett's production stars Marianela Nuñez and Vadim Muntagirov. Join the Company as they rehearse Wayne McGregor's ballet, set to a score by Max Richter. The Royal Ballet's production of the 19th-century Russian classic will be relayed to cinemas from London.